Silver Spring Shores — One of three suspects arrested in connection with an armed burglary that occurred on September 11, 2013, has been arrested again on drugs and gun charges. Detectives, along with deputies, including one K-9 deputy, returned to Silver Springs Shores on Friday, September 13, 2013, after obtaining probable cause to confiscate the 2010 Dodge Charger that was used in an armed home burglary on Wednesday and believed to be owned by 22-year-old Laquan Barrow. When detectives arrived in the area of the 9000 block of Spring Terrace, they spotted the Charger, which Barrow had just entered the driver seat of and left the residence. According to authorities, detectives followed the vehicle driven by Barrow, who began making a series of turns and quick accelerations, stopping in another driveway as a detective was conducting a traffic stop on the Dodge Charger. Barrow’s passenger later identified as Edwin Summers, jumped out of the vehicle and took off running but then stopped, returned to the vehicle, grabbed a pink “Hello Kitty” bag out of the car, and ran away again. K-9 deputy Tyson Collins arrived with his dog Sig, and chased after Summers. A short time later, Summers, who was still in possession of the bag, was apprehended by Deputy Collins. An inventory of the bag showed 449 grams of marijuana inside a gallon Ziploc baggie and a digital scale. A detective ordered barrow to remain in the vehicle as he began to exit, which he hesitantly complied, according to authorities. A search of the vehicle turned up a loaded handgun in the driver’s side door. When the detective was retrieving the weapon from the door, Barrow said, “It’s my aunt’s gun.”There was also a marijuana cigarette laying under the car on the driveway. 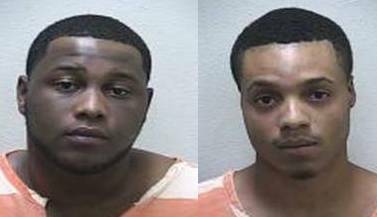 Both Barrow and Summers were arrested and taken to the Marion County Jail. Summers was charged with one count of marijuana possession with intent to sell, one count of possession of drug paraphernalia and one count of resisting an officer without violence. Summers has since been released on a $51,000 bond. Barrow was charged with one count of possession of marijuana with intent to sell, one count of possession of a firearm during the commission of a felony, one count of possession of drug paraphernalia, and one count of possession of marijuana less than 20 grams. He was released the next day on a $61,000 bond.